A little mouse girl has a long name and other kids make fun of it. The teacher has a similar name, so she helps to change their attitudes quickly. 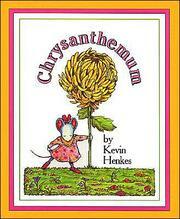 Henkes, Kevin, “Chrysanthemum,” Children's Picture Book Database at Miami University, accessed April 21, 2019, https://dlp.lib.miamioh.edu/picturebook/items/show/5977.